Different stages with diagrams to give a clear concept of the changes taking place at each step. Significance of mitosis and meiosis should be discussed. The process by which a mature cell divides and forms two daughter cells which resemble the parent cell in a number of characters is called cell division. The somatic cells divide by mitosis or equational division. The germ cells divide by the process of meiosis or reduction division. Oskar Hertwig discoverd and described meiosis. The sequence of events a cell undergoes from one cell division to the end of next cell is called cell cycle. It can also be described as the changes which occur during cell growth and cell division. It is the stage in between two successive cell divisions during which the cell prepares itself for the process by synthesizing new nucleic acids and proteins. Chromosomes appear as chromatin network. Interphase consists of the following three sub stages. This phase starts immediately after cell division. The cell grows in size and there is synthesis of new proteins and RNA needed for various metabolic activities of the cell. A non-dividing cell does not proceed beyond G1 Phase. The differentiating cells are said to be in G0 Stage . During this phase there is duplication of DNA. Thus each chromosome now is composed of two sister chromatids. The proteins responsible for the formation of spindle fibres are synthesised during this stage. This phase is the phase of division. division of cytoplasm – cytokinesis. It involves separation of sister chromatids and their redistribution in the daughter cells. Here the cells stop dividing, grow in size and undergo differentiation to perform specific functions. Thus the cells which do not proceed beyond the G1 phase enter this phase. The cell cycle consists of G1, S, G2 and M phase. The oldest hypothesis regarding cell division is that, it is triggered directly by the growth in cell volume. As the cell grows, the ratio of nuclear volume/ cytoplasmic volume (karyoplasmic ratio) would decline. The falling of this below a critical level would trigger nuclear growth and division. 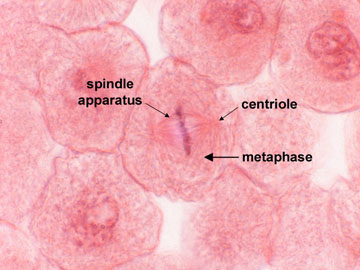 In 1908, Popoff showed that cutting off some of the cytoplasm in Amoeba did delay the cell growth, if it was done sufficiently early in the cell cycle. Amitosis is the process which cells divide without spindle formation. The division of bacteria, Amoeba etc. The division of a parent cell into identical daughter cells having the same number and kind of chromosomes. Specialised division occuring in reproductive cells and results in the formation of haploid cells. Mitosis was discovered in plant cell by Strasburger. It occurs in meristematic regions. In animal cell it was discovered by Boveri and Fleming. It occurs in developing embryo and skin and bone marrow. In plants, active mitotic cell division takes place in shoot and root apices. that are genetically identical to the parent cell. Mitosis occurs during growth and asexual reproduction. A fertilised egg divides many times by mitosis to form an embryo. But so do the cells in your skin, bone marrow and in a healing wound. In flowering plants, growth is greatest at the shoot and root tips. 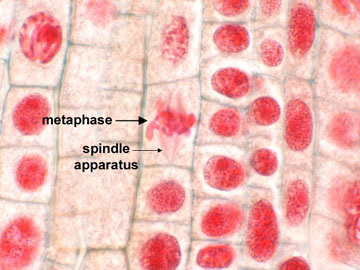 Here mitosis occurs in particular areas called meristems. Since the number of chromosomes in the parent and progeny cells is the same, it is also called as equational division. ThE stage between divisions is known as interphase. It is sometimes called the ‘resting stage’ but in actual fact the cell is metabolically active. • new organelles, for example mitochondria, are made. No chromosomes are visible at interphase because the chromosome material, chromatin, is dispersed throughout the nucleus in a diffuse form. Prophase is the longest stage in mitosis. • The chromosomes become visible as long thin threads. • The chromosomes start to coil up and become shorter and thicker. • In animal cells, the centrioles divide and move to opposite ends (poles) of the nucleus. • Protein microtubules develop from each centriole, forming spindle fibres. Some of these extend from pole to pole. In plant cells, there are no centrioles and the spindle forms independently. • Towards the end of prophase, each chromosome can be seen to consist of two chromatids held together by a centromere. • At the end of prophase, the nucleolus disappears and the nuclear envelope breaks down. The chromosomes now lie free in the cytoplasm. Metaphase is a relatively short stage in mitosis. Consequently, it can be difficult to observe on a slide section. • The chromosomes move towards the equator of the spindle. • Here they attach themselves to a spindle fibre by means of a centromere. The mitotic spindle is composed of three distinct types of microtubule fibers. They work to move the sister chromatids apart toward opposite spindle poles. All three of these distinct spindle microtubule fibers grow out from the centrosome, and all are polymers composed of alpha and beta tubulin subunits. A microtubule grows by the addition of tubulin subunits to one end of the polymer. 1. Kinetochore microtubules attach to the kinetochore of a chromosome. There are two kinetochores per replicated chromosome, one for each sister chromatid on opposite sides of the chromosome. During prophase, a kinetochore microtubule grows from the centrosome, and by prometaphase it encounters a kinotechore, binds the proteins within the kinetochore and "grabs" the chromosome. The effect of being grabbed by kinetochore microtubules from opposite poles is a balancing of opposing forces, which results in alignment of the chromosomes at the spindle equator during metaphase. In mammalian cells, many kinetochore microtubules are associated with each sister chromatid. 2. Polar microtubules are those that do not attach to the kinetochores but do overlap at the midpoint between the two poles. 3. Aster microtubules are those tubules that point away from the spindle equator and are attached to the cell's cortex. A microtubule has distinct polarity; the growing end is termed the plus end, and the end associated with the centrosome is the minus end. The plus end can grow by addition of tubulin subunits (polymerization) or shrink by the loss of tubulin subunits (depolymerization) from the plus end. Other than this, microtubules are also associated with a variety of proteins that can affect the stability of the polymer. The microtubules are associated with motor proteins, which are proteins that can travel along the length of a microtubule in an energy-dependent fashion. Motor proteins move toward either the plus end or the minus end of a microtubule fiber. The separation of the chromosome during anaphase occurs in a two-step fashion, referred to as anaphase A and anaphase B. In anaphase A, the kinetochore microtubules shorten by depolymerization at their plus ends, and motor proteins associated with the kinetochores keep the chromatids linked to the shortened plus ends, retaining the attachment of the chromatids to the kinetochore microtubules. 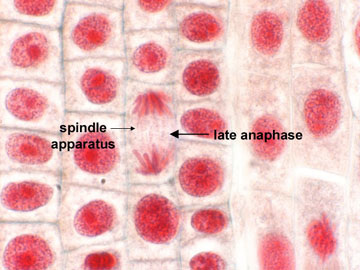 During anaphase B, the two spindle poles move further apart. This occurs by the sliding of the polar microtubules. The polar microtubules are interlocked with each other at the equator. The polar microtubules grow by polymerization at their plus ends, while a pair of cross-linked motor proteins travel toward the plus ends of opposing polar microtubules and act to push the spindle poles apart. Finally, motor proteins associated with the plus ends of the aster microtubules pull the spindle poles toward the cell's cortex and even further apart. Thus by a combination of pushing and pulling, the sister chromatids are separated. 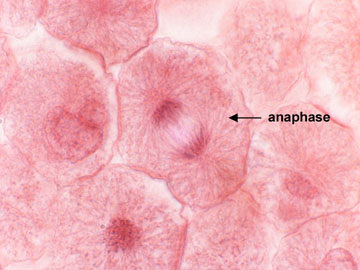 Anaphase is also a short stage in mitosis. • The centromeres holding each pair of chromatids together divide. • The free chromatids move to the poles, centromere first. This movement results from the contraction of the spindle fibres. As they shorten, they pull the chromatids apart. The chromosomes assemble in sets at the two poles. • The chromosomes begin to uncoil and eventually assume the extended state characteristic of interphase. • A nuclear envelope reforms around each chromosome set, the spindle disappears, and the nucleolus reforms. Nuclear division by mitosis is complete at this point. The cell begins to divide into two new cells, once the sister chromatids have reached the opposite poles. This division of the cytoplasm occurs differently in animal and plant cells. 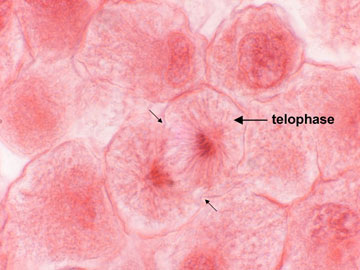 In an animal cell, a contractile ring forms around the midpoint of the cell (perpendicular to and centered on the midpoint of the mitotic spindle). This contractile ring is composed of microfilaments of actin and myosin. As this ring contracts, it creates a cleavage furrow that drags the plasma membrane inward, eventually pinching the cell into two new cells. 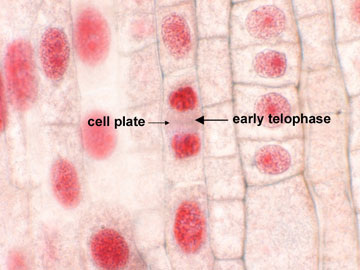 In a plant cell, a cell plate is initiated perpendicular to and at the midpoint of the mitotic spindle. This cell plate is created by the fusion of vesicles derived from the Golgi complex, which contains the necessary polysaccharides to form the cell plate. The cell plate is bound by a new plasma membrane that becomes continuous with the preexisting plasma membrane of the cell. The cell plate eventually fuses with the cell wall of the parent cell, thereby dividing the parent cell into two daughter cells. Mitosis is important for growth and regeneration of body cells.In flowering plants, organs such as bulbs, corms, tubers, rhizomes and runners are produced by mitotic division. When they separate from the parent they form a new individual. Mitosis can result in the production of large numbers of offspring in a relatively short period of time. But there is little or no variation between each individual. It is seen, mitosis of cells grown in tissue culture have important applications in both genetic engineering and biotechnology. Colchicine is a water-soluble alkaloid found in the crocus flower Colchicum autumnale. Colchicine blocks or suppresses cell division by inhibiting mitosis, the di. Specifically, it inhibits the development of spindles as the nuclei are dividing. Normally, the cell would use its spindle fibers to line up its chromosomes, make a copy of them, and divide into two new cells. With colchicine present, the spindle fibers don't form, and so the cell can't move its chromosomes around. The cell may end up copying some or all of the chromosomes anyway, but can't parcel them out into new cells, and so it never divides.